Business premises on the High Street, vacant as of August 2018. Still vacant as of October 2018. 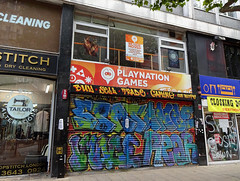 It was previously a games and video games shop called Playnation Games photo, but in August 2018 this moved to the Whitgift Centre to share premises with Heart of Gaming. Previously Labels 4 Less (this was on the frontage as of July 2008 and also July 2009, according to Google Street View, though the shutters are down in both images so it wasn't necessarily still open). As of May 2012, the frontage read "High Street Bathrooms" and advertised "bathrooms, kitchens, plumbing, hardware" photo. They seemed to sell lamps and lights as well. As of March 2013, there was a notice outside photo stating that "Kitchen & Bathrooms" had moved, though no new address was given. In early November 2013 it became the new location of M & M Games (previously located at 6 The Arcade just across the High Street). Along with the move, M & M Games changed its name to Playnation Games. Last edited 2018-12-09 14:51:39 (version 46; diff). List all versions. Page last edited 2018-12-09 14:51:39 (version 46).